2.) Hide your phone somewhere not in your immediate vicinity and TURN IT OFF/ON SILENT! 4.) The library/EUCR is an amazing place to focus and study! 5.) 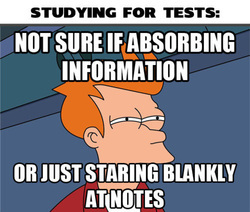 If you get to class early, review your notes from the previous days! 7.) Write notes in black pen, and when it's time to study go through and color-code with highlighters. 8.) Never study in bed, you will fall asleep. 9.) Study with other students!